After discussions with 2 highly skilled Colorado birders, one who has held birds of this species in his hand during banding,and review of uber close-up photos taken in hand, it has become clear that this bird is likely a Savannah Sparrow and not a Baird's. 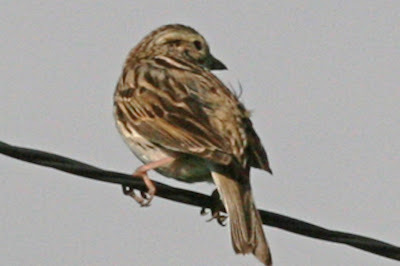 On a utility wire next to some of the agricultural fields I was checking in the Salida area yesterday, I heard singing from a sparrow that stopped me in my tracks. It was a very distinctive tinkling song with trills that was unfamiliar to me. I only this one pic and that is also the only view I got before it blew down into the tall grasses in the field. Yesterday I had a meeting for most of the day in Salida,CO area which is tucked into at around 7,000 feet in elevation and surrounded by 14,000 foot+ peaks. I did get in late afternoon birding before heading home down a winding canyon road. Since I had found Dickcissels in hay fields in the Salida area in 2006, I spent some time driving around these fields. Sibley notes that Eastern Meadowlarks have a mostly white malar and dark streaks on their sides. Birds of North America online states, "Difficult to distinguish from Western Meadowlark. 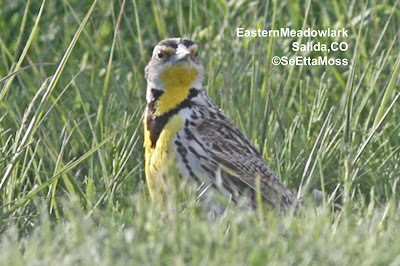 Yellow of throat on Eastern Meadowlark does not extend on to malar region in most subspecies (yellow in Western Meadowlark), birds average darker and browner above, with less discrete barring in wings and tail and more white in tail." 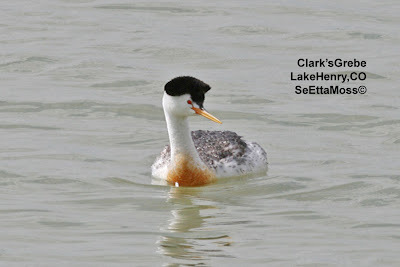 When I scoped for waterfowl at Lake Henry (near Ordway,CO), I was disappointed to find no nesting grebes. Last summer hundreds of Clark's and Western Grebes nested here in the vegetation growing on the west side of this lake. In fact there were few Western and Clark's Grebes compared to the numbers I usually see here.